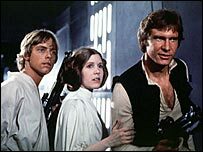 It's 30 years since the release of sci-fi classic Star Wars, considered by many to be among the greatest films of all-time. But what would it be like to watch it now, for the first time? BBC News entertainment reporter Kevin Young's sole exposure to science-fiction to date consists of lusting after Gillian Anderson in The X-Files for a while in the 1990s. 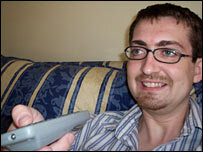 Despite fearing it was two hours of his life he'd "never get back", he offered to lose his Star Wars virginity. Things seem to have started badly when a DVD arrives entitled Star Wars IV: A New Hope. I want the original, not some dodgy sequel - although the sleeve does say 1977 and the cast looks right. I check online and discover this is, in fact, the special edition of the first in the series. So, on we go at Warp Factor 8, or whatever it is that sci-fi fans say. Oh, this is complicated - the writing on the screen is going too fast and I have to rewind to read the opening caption. It seems that the Empire and its Death Star are bad and Princess Leia and her starship are good. I look forward to learning more. Something's under attack from a big white thing with green lasers! 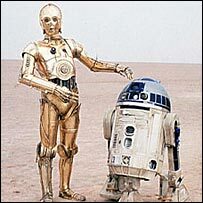 Catch my first glimpse of the characters I know to be C-3PO and R2-D2, although I've no idea which is which. A door explodes and some strange people in white outfits and matching masks burst through, firing red lasers. They look a bit like Darth Vader so maybe they're friends with him. Darth has arrived - they were his helpers after all. And it turns out R2-D2 is the one which looks like a dustbin and also strangely like Metal Mickey, a star of ITV's Saturday teatime schedule in the early 1980s. C-3PO's passage across the corridor as he struggled to avoid the crossfire was rather slinky. It emerges that Darth can not only kill a man with one hand but also that he wants the plans to the Death Star back. Now. C-3PO and R2-D2 are making me laugh. They're like bickering lovers. I hope Princess Leia escapes Darth's evil clutches and makes it to Alderaan. There's some kind of cloaked cat behind the rocks. R2-D2 has worked this out and is rolling along quite cautiously now. The cats have guns and they've killed R2-D2, the brutes! R2-D2's battered shell is sucked into some kind of workshop, where downtrodden machines seem to live. R2-D2 is alive after all! Hooray. And he's found his old buddy C-3PO among the assortment of machines inside what now turns out to be a rusting tank with caterpillar tyres. We're back in the desert with Darth's helpers, who seem to be riding around on braying dinosaurs. The rusty tank looks a bit more respectable now there's daylight. Luke Skywalker arrives. He seems to know the cloaked cats and he's being told off by for wanting to hang out with his friends at the power-converted station instead of doing his chores. Maybe that was his dad. It was his Uncle Owen. R2-D2 has footage of Princess Leia which he can beam out as a holograph. Luke seems quite taken by this holographic vision in blue and wants to know more about her. I have a sneaking suspicion that they might end up as this film's golden couple, but there's still an hour and 38 minutes to go yet. I'm also hoping to learn more about this Obby One Kanobby fellow, not least how to spell his name. R2-D2 has stormed off in a huff. The excitement of starring in a classic film is all too much for him, the poor love. Another set of baddies, judging by the urgent music. They dress differently from the others and use woolly mammoths as their transportation of choice. Surely those animals won't be any match for Luke's floating red spacecraft? The bandits are called Sand People. Luke's out cold. R2-D2 knows better than to get involved and skulks in a cave. It's Alec Guinness! "Hello there" to you too, sir. He's one of the cloaked cat characters, although obviously I can now tell they're not cats after all. Is he this Obi fellow? Yes, he is, although his name is also Ben, confusingly. C-3PO's pessimism - "I'm done for" - is still making me laugh. Swoosh! It's a light-saber. It looks cool. I wonder how it works, though - does its laser burn enemy combatants or does it shoot some kind of fatal beam? And will it be used to save Princess Leia? Important plot twist here, I predict - Darth killed Luke's dad. May the Force, another concept just introduced, be with him in seeking revenge. Princess Leia hid the plans inside R2-D2's memory. I hope someone doesn't blow him up trying to retrieve them as I'm becoming quite attached to him. One of Darth's special strengths is the ability to choke people from a distance, without touching them. He's just done that to a power-hungry man in a uniform during some kind of intergalactic board meeting. "Don't mess with me" was the message there, I think. Luke hovers off home - after a reference to Imperial Stormtroopers, whom I guess are Darth's friends - to find his home torched and, presumably, his aunt and uncle dead. He looks sad. Evil Darth is going to inject Princess Leia with some harmful substance. I thought American drama 24 invented this tactic - someone turns up with a silver suitcase full of syringes every five minutes on that show - but apparently it was all the rage in the '70s too. A man walks into a bar... Luke's decided to make it his mission to be a Jedi and goes for a quick drink to celebrate in a dusty desert town full of domes, dinosaurs and jazz-playing aliens. So that's how a lightsaber works. Luke gets into a bar fight but Obi uses his laser to slice off the arm of the man who was bothering him. Everyone goes back to their cocktails. Han Solo - or Indiana Jones as I had thought of Harrison Ford until now - has arrived as captain of the Millennium Falcon. This is a very fast ship which Obi wants to charter. But he's not very good at bargaining. Hans wanted to charge him 10,000 units but Obi offered 17,000, the cash-rich fool. Han owes Jabba the Hut some money. Jabba's turquoise "enforcer" turns up to collect it, but Han won't have it until he's taken Obi to Alderaan. The "enforcer" gets blown up, which makes it two murders in five minutes. Must be a rough bar as nobody bats an eyelid. Princess Leia looks pretty good for a woman who's resisted torture, with barely a hair out of place. But she's shaken when the baddies blow up Alderaan. Obi and Luke have reached cruising altitude so it's time to take off the seatbelts and unwind a little. Luke is practising his swooshes with the lightsaber and trying to feel the Force, while R2-D2 is beating Chewbacca at a game involving holographic dinosaurs. The Millennium Falcon arrives where Alderaan used to be but finds it's nothing more than an asteroid belt. There's a big spherical space station ahead and Luke has a very bad feeling about it. Stormtroopers capture the Falcon but they believe there's no-one on board. I hope our heroes have found a safe hiding place somewhere. They were under the floorboards. Phew. R2-D2 has come up trumps once again after sticking out a droid-arm and docking with the spaceship's computer. He's pinpointed Princess Leia's precise location onboard. What a droid! But Leia's about to be "terminated" so it's time to press on with a plan which may involve Han being suave and dashing. Will Luke have a love rival in the race for Leia's affections? 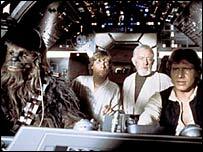 Luke and Han are doing very well at finding their way around the spaceship, given that they've never been here before. Wake up, Princess Leia. Look who's arrived in your cell. It's Luke Skywalker, and he's here to rescue you! Han is being a bit snappy with the princess. Admittedly he's under attack but surely calling her "sweetheart" isn't going to win her heart. Luke's ankles have been grabbed by some kind of one-eyed octopus and he's dragged under water. He escapes but then the walls of the room holding our heroes start to close in. It looks like they're in some kind of giant rubbish crusher and the race is on to get out of there. The Stormtroopers find C-3PO, who squeals like a pig immediately and reveals his friends' plans. This is a very poor showing from the golden pessimist. Don't androids have any guts? Just as they're all about to get a lot thinner, as Han puts it, R2-D2 manages to shut down the crusher. This droid really is doing well and is shaping up to be the hero of the hour. Leia calls Chewbacca "a big walking carpet", which seems a little unfair. Obi is skulking around the space station, pressing buttons and moving levers. I'm not sure what these do. Big strong Han is starting to impress Leia with his courage and strength. I think she's falling for him. Would Luke Skywalker and Han Solo be able to defeat Darth Vader? Luke has a white utility belt which matches his karate suit and, luckily, contains a climbing rope. He hooks it up and swings to safety across the void, carrying Leia as he goes. Now who's big and strong, eh, Han? "I've been waiting for you, Obi Wan." It's red versus blue in the lightsaber stakes as Darth and Obi square up to see who's really the master. Darth takes a final swipe at Obi to round off their laser-jousting, but ends up cutting through an empty cloak. Is Obi dead, or has he used some special Force power to escape? Leia is reunited with her loved ones on the planet Yavin, but Darth knows she's there and looks set to catch up with her. Yavin looks very green and lush, with more trees than anywhere else we've been so far on this trip. Planet Yavin's finest military personnel have gathered to hear how they can destroy the Death Star, but even they look unsure about whether they'll be able to target the two-metre shaft which holds the key to its destruction. Luke is the only one who thinks they can do it. Han isn't going on this mission, though. Too dangerous for him, the wimp. Luke gets a peck on the cheek from Leia while grieving for Obi. Things may be looking up for him in the romance stakes. Luke lifts off with the rest of the squadron. Their ships all have red go-faster stripes this time. He's hearing Obi's voice in his head, with another reference to the Force being with him. It's the 491st mention of the Force so far (I may have lost count somewhere in the middle, though). They've arrived at the Death Star. Let the battle commence! Luke gets "a little cooked" during a close run-in with the enemy but is holding up well. Darth has jumped in a plane now, though, to take a bit of the glory. It's getting tense. The pilot trying to find the two-metre shaft missed first time and lost his starboard engine. Now he's been shot down. It's up to Luke to step up and save the day. Is he on a suicide mission, as Han predicted? 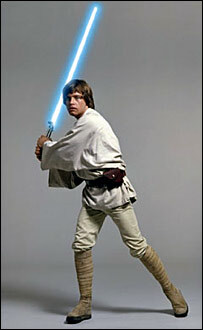 Luke switches off his tracking device and tries to use the Force. But Darth has shot R2-D2, who was riding pillion-style on Luke's plane. No! The entire course of the film changes in 30 seconds - Han turns up in his plane to fend off the baddies while Luke lines up his shot and makes the target. The Death Star is blown to smithereens and Darth's plane is spinning out of control. Go boys! Our heroes are quickly back at base and C-3PO is offering to be the robot equivalent of an organ donor if it helps to repair R2-D2. Maybe that droid isn't such a wimp after all. There's a big fanfare as a special ceremony begins at which Princess Leia presents her two "boys" with medals. She's fixed her hair differently so we know it's A Big Deal, but then the film ends without telling us whether she falls in love with Luke or Han. Talk about a cliffhanger. I'm going to have to watch the second one now to find out if they get it together. Anyway, R2-D2 is fixed and gleaming, Darth Vader is out of the picture - without any mention of what happened to Luke's dad, mind you - and the Force is very much with everyone once again. I really quite enjoyed that. How does it feel to watch the movie for the first time? Did it change the face of film?